The Great Hall was a four-story tall chamber situated directly beyond the Temple Main Entrance. A large meeting chamber with many tiers and balconies, seats would be brought in for formal gatherings and conclaves. Between many of the pillars lining the hall were passages and stairways leading to small chambers near the Hall. In addition, several banks of turbolifts led into the depths of the Temple, ensuring that the Great Hall could be reached from any level of the complex. Off one of the tiers was a small lecture hall where younglings came for group learning sessions. 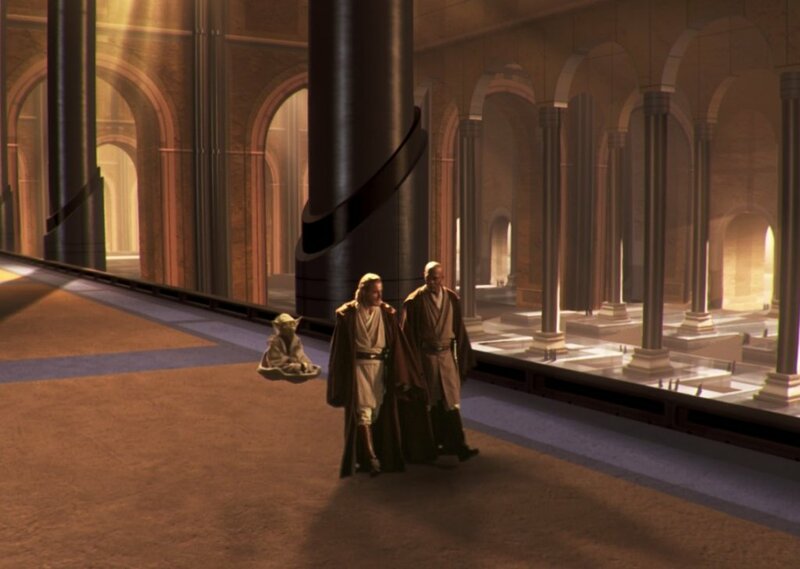 Jedi knights, padawans and masters all walk, meet, and speak in the great hall as a common area in the center of the Jedi Temple. Comments for "Jedi Temple Great Hall"
License details for "Jedi Temple Great Hall"